Kathy Holmes, a Raleigh divorce attorney at the law firm of Hatch, Little & Bunn, LLP is one of only 197 lawyers statewide to achieve the distinction of a specialist in family law. While everyone at Hatch, Little & Bunn, LLP applauds Kathy for being recognized as a Family Law Specialist, her clients are the true beneficiaries of Kathy’s demonstrated expertise and ability. 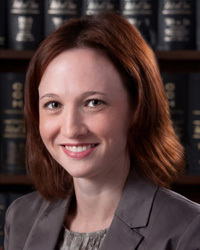 Raleigh divorce lawyer Kathy Holmes of Hatch, Little & Bunn, LLP has been certified by the North Carolina State Bar as a specialist in family law. Only 197 attorneys are board certified in family law in North Carolina. Kathy Holmes concentrates her legal practice in the areas of child custody and support, alimony, equitable distribution, adoption, collaborative law, and separation agreements. She received her BA degrees in Psychology and Criminal Justice, a minor in Political Science, and her JD degree from Campbell University. Ms. Holmes is also a member of the Family Law Section of the North Carolina Bar Association. The North Carolina State Bar certifies lawyers as specialists in designated practice areas as a service to the public. The program assists members of the public in the selection of legal counsel by identifying lawyers who have demonstrated special knowledge, skill, and proficiency in certain areas of law. The program also gives lawyers a credible way of making their expertise known to the public and other attorneys. According to firm representative Joanne Snider, "While everyone at Hatch, Little & Bunn, LLP applauds Kathy for being recognized as a Family Law Specialist, her clients are the true beneficiaries of Kathy’s demonstrated expertise and ability." The law firm was created in the mid 1950s, when a former Superior Court Judge, a former Clerk of Court, and a Wake Forest University Trustee came together to form Hatch, Little & Bunn. Their mission was, and remains, to provide unmatched legal services to individuals and small businesses in a friendly environment where every client receives the utmost in personal attention. In 1964, the firm purchased and renovated the Henry Hicks Home on Hillsborough Street. For more information about the firm, please go to http://www.hatchlittlebunn.com/ or call 919.899.9827.